When a renowned environmental advocate, Dr. David Kruipen (Val Kilmer), discovers the carcass of a woolly mammoth in a polar ice cap, he leads a team of four bright ecology students in a research mission at a remote Arctic station. The group uncovers information beyond their wildest dreams...and nightmares when a prehistoric parasite revives and searches for a new warm-blooded host. Now infected, the unsuspecting students are forced to choose between a quarantine that will result in their death or a global epidemic. Decided to watch this one this morning. It has been sitting in my unwatched pile since this past September. I had planned to watch it for last year's October horror marathon but never got to it at the time. It's not a bad movie... but I have definitely seen better. The story is not all that original and I did find it a bit on the slow side. But it was worth what I paid... especially since I got my copy used for a cheap $1.64. Other then the people listed above this one also has another face I am familiar with. Aaron Ashmore is in this film... I know him previously from Smallville... where he played Jimmy Olsen. For anyone who's ever been picked on, put down or pushed around, your heroes are here! Rob Schneider, David Spade and Jon Heder (Napoleon Dynamite) star as three older guys who know what it's like to be bullied. After catching some nasty neighborhood kids picking on a friend's son, they strike back by forming a three-man baseball team to challenge the state's best Little Leaguers. Now, cheered on by every nerd, geek and misfit in town, these underdogs are about to have a field day in this slapstick hit comedy from the director of Big Daddy and Happy Gilmore and producer Adam Sandler. Felt like watching some comedy today. Going into this one I wasn't expecting much of anything. The trailer looked like it could go either way. While I have seen better baseball comedies before.... I found I still enjoyed this one quite a bit. Sure it gets a little silly at times. But I found myself laughing at it more then once. They went a bit over the top with the nerds and geeks thing. Over-all it is a fun watch... I can easily see myself watching it again sometime. I was surprised when I found that I enjoyed this movie. Maybe it is because I had such low expectations. But one thing that definitely helped... they didn't just remake the series with the same characters... it is more like a continuation of the series. Where they are re-opening the Jump Street program. It was cool to see Holly Robinson Peete with a cameo appearance as her 21 Jump Street character... Officer Judy Hoffs. Other old Jump Street characters that made an appearance is Tom Hansen and Doug Penhall... now partners at the DEA. They were under cover and in disguises... but I am almost positive it wasn't Johnny Depp and Peter DeLuise reprising their roles. Whoever they were... they were not credited in the credits. I remember reading something that said Depp was going to do a cameo in the movie. I rewatched the scene this morning... looking at it again... that very well could be Depp. Though I am not sure enough to add him to profiler as an uncredited. And I would be surprised if it is DeLuise with him... but possible since I haven't seen him in years. I just looked on IMDB... not that I trust them all that much for this... but according to them that was indeed both Johnny Depp and Peter DeLuise. It also says Richard Grieco appeared as Booker as well... but I don't remember seeing him or his character at all in the movie. When catastrophe strikes, Superman once again rushes into action, but this time he gets some unexpected help from a new squad of super heroes calling themselves The Elite. Comprised of four powerful beings and spearheaded by the brash and calculating Manchester Black, this new force brings a raw, no-holds-barred mentality to the battle against evil. With swelling public support of The Elite's vicious methods, the stage is set for a showdown that has Superman feeling outnumbered and outdated. Featuring a stellar voice cast headed by George Newbern, Pauley Perrette and Robin Atkin Downes, this epic DC Comics Premiere Movie adventure explodes with a clash of styles and super powers that begs the question: which will break first – The Man of Steel or his code? I am always happy when I see a new animated superhero movie released. While I enjoyed this one... it isn't one that will rank up there with my favorites. The storyline is good... but not thrilling. I really can't put my finger on it... but there is something about the animation that didn't impress me as much as they usually do. It seems something was just off about it. This isn't a good sign... but the highlight of this film for me was the fact that Lois Lane was voiced by Pauley Perrette who plays my favorite character on NCIS. But even with all this said, I didn't hate this film. I guess I would say just slightly disappointed in it. An astrophysicist has made a cataclysmic discovery: The sun is set to explode, bringing about the end of civilization. As a team of fellow scientists race against time to stop his predictions of apocalypse from coming true, the world is already becoming a whirling inferno out of control. Felt like a natural disaster movie this morning. This is in a 4 movie set (2 of which is about 3hrs long) that cost me about $5.00.... which means it is about $1.25 per movie. So at that price I really can't complain too much. 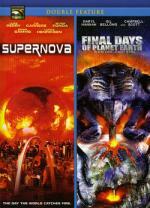 Supernova is an almost 3hr TV movie that originally aired on the Hallmark Channel. Not that this is a bad movie... I did enjoy it for what it is. It is just that there was a lot of slow parts. Not surprising with a 3hr movie.... but there is plenty here that could have been taken out to make a more exciting story. I did like the one side storyline that they had going... where we learn earlier on one of the scientist's wife was brutally attacked... the attacker now in jail... but swearing to get revenge. This attacker escapes and comes after the wife and their daughter. The main storyline... while interesting... definitely could have been better. I think it could have had a better conclusion as well as shortened some. But it isn't bad for a lazy day of TV watching... just don't expect too much from it. They locked up mob boss Paul Vitti in Sing Sing and that's where he sang sang – croaking tunes from West Side Story and carrying on in a way that convinces the feds Vitti is better suited for a nut house than the Big House. Better yet, they conclude, let's release Vitti into the custody of his therapist Ben Sobel. The boys are back and so is the fun when Robert De Niro (Vitti) and Billy Crystal (Sobel) reprise their Analyze This roles. This time, Vitti is ready to find gainful employment and go straight. Or so he says. But can high-anxiety Sobel believe Vitti, especially when guys like Lou the Wrench keep showing up? In the words of more than one sage who knows his dese from his dose: fuggedaboudit! 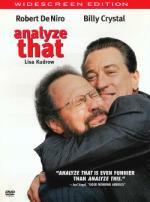 It has been years since I seen the first movie (Analyze This)... and this is the first time I ever seen this movie. But not seeing the first one in so long didn't hurt my enjoyment of this one at all. I enjoyed this movie... found it to be pretty fun. But I believe I remember liking the first part more. I at least didn't find it as funny as I expected to. But it was definitely worth the hour and a half I put into watching it. X-Men: First Class is the thrilling eye-opening chapter you've been waiting for...Witness the beginning of the X-Men Universe. Before Charles Xavier and Erik Lensherr took the names Professor X and Magneto, they were two young men discovering their superhuman powers for the first time, working together in a desperate attempt to stop the Hellfire Club and a global nuclear war. I just finished watching this movie. Going into it I must admit that I was a little concerned as I never read the comics. I only ever seen the previous movies and some of the animated series from a few years back. So most of the mutants in this movie I wasn't familiar with. And it was right strange for me to see Professor X both young and with hair as well as walking. I was also surprised at the type of relationship Professor X shared with Mystique. Though obviously I don't know if that is the way it was in the comics as well or not. So going strictly by what I know from the previous movies and somewhat on the animated series I found I really enjoyed this... (what is this btw, a prequel? a reboot of the films? I guess that depends on how well this film did) I found I really enjoyed this film. It has a good story that kept my interest... some fun new mutants to watch... as well as some good action. I would recommend this film. I think it was meant as a prequel. At least I don't thinkit was meant at a reboot. Most occurences seem to fit with the universe set up in the other films. The relationship between Charles and Mystique in this movie is not from the comics. Mystique's back story is changed a lot. My theory is that they decided to put her in this movie because she was popular in the other movies - probably because she was walking around basically naked most of the time. Ohhh...If you saw Wolverine, there at the end when he helps break kids out of that facility, there is a young Emma Frost there..and that is years after the events in First Class. So. I think that raises issues if all the X-Men movies - including Wolverine - are supposed to be connected. That has Emma aging backwards. I did like the movie overall, but some of the big ...changes to things did irk me a bit...and I'm not even that familiar with the comics. I know all this just from things I've read over the years. I felt like watching the sequel... but before doing so I wanted to re-watch the original film as it has been a good 3 or 4 years since I seen it last and really didn't remember too much about it. Only really remembered that I enjoyed it. Sure... this movie wasn't perfect... but what it was... it was a whole lot of fun and it looked awesome! And I think that is what I liked the most about this movie. While I did like the story... the effects were just great and a whole lot of fun to watch. It is funny... when it comes to Nicholas Cage... I either like him in something or I just hate him. I don't know why. When I first heard he was doing this I thought well there goes any chance of this movie being any good. But I was really wrong... I found I liked him a lot in this role. I also really enjoyed Sam Elliot in his role. NICOLAS CAGE returns as Johnny Blaze in Ghost Rider™ Spirit of Vengeance. Still struggling with his curse as the devil's bounty hunter, Johnny is hiding out in a remote part of Europe when he is recruited by a secret sect of the church to save a young boy from the devil. At first, Johnny is reluctant to embrace the power of the Ghost Rider, but it is the only way to protect the boy and possibly rid himself of his curse forever. This is my first chance of watching this film. It is one I was excited to see since I enjoyed the first one so much. I was maybe even a little too excited to see it.... hoping that I wasn't expecting too much and setting myself up for disappointment. I found that I enjoyed this one quite a bit. I think I enjoyed it just as much as the first part. The first one is a little longer then this one. But this one didn't need to be as long... it didn't have to tell the origin story. While I have heard some people say this one wasn't as good as the first part.... I also heard (even more) people say if you liked the first one... you will like this one as well. And those are the people I find myself agreeing with. I am blanking out on his name already... but I liked the character that could make anything (or anyone) decay with a simple touch. I am not familiar with the comics... so not sure if he is a character from them... but I wouldn't be surprised if he is. Over-all... I have to recommend this one. Especially if you enjoyed the first one.